Your tour has designated pickup spots in Limerick. Please remember you must reconfirm your pickup location with the supplier before the day of your tour. Pickups happen early in the morning, and specific times are designated by different locations. On the day of your 11-hour tour, once you get picked up, sit back and relax on your bus ride around the Ring of Kerry. 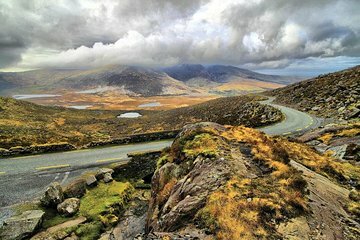 This route in County Kerry, Ireland, is considered to be one the most beautiful rides in the entire world. Start by passing through Killorglin to Dingle Bay. See stunning scenic views along your way, including Inch Beach. Continue on to the villages of Waterville and Sneem. In Sneem, see where the River Sneem meets the Kenmare Bay. Next up, ride over to the Killarney National Park where you can catch a glimpse of the lakes of Killarney and Black Valley from stops at Molls Gap and Ladies View (Leprechaun Crossing). Last, visit the Torc Waterfall. Make sure to snap pictures of the fall before your tour ends. Your tour drops you off at Arthur’s Quay Shopping Center in Limerick. We loved this tour! It was one of the best things we did in Ireland. We got to stop at all the best points of interest and our tour guide was very knowledgeable. We really appreciated the transportation from Limerick to Killarney as well. Fantastic experience. Our tour guide Michael Dougherty was fantastic, he made the experience very enjoyable with his lively commentary and friendly nature. I highly recommend this tour to any visitor going to Ireland. Nice day tour. Driver was good. Price was great! The Torc waterfall and surrounding grounds was spectacular. Tour guide was knowledgeable and friendly. Another very long day on the bus...the Torc Waterfall was beautiful and the scenery around Kerry is beautiful. Absolutely the best way to see the Ring of Kerry, Great stop for lunch Guide was informative and fun. This is a beautiful drive but very long! every bit of the 11 hours. Because of the distances to be covered it is pretty much a long bus trip with stops to get out and take pictures. YOu do hike up to the Torc falls but you only get about 30 minutes. The tour company should have told us there was a big football game going on in Killarney where we met the 2nd bus which severely affected traffic. Streets were blocked off and the bus had to take a longer route around it, thus delaying our tour. We did not stop frequently enough or for a long period of time 45 minutes is not long enough for a bus load of people to get lunch and look around the town. We stopped 30 minutes in Sneem to accommodate people looking up their ancestry. There was no parking at the waterfall so we missed that. We had to wait 30 minutes again due to traffic to meet up with the bus in Killarney. The delays added about 3 hours to our already long day. The sites were beautiful, but most of my pictures are from the bus window.